I would say that Slovenians, we’re a salad nation. It sounds funny, but if there’s no salad in your meal, your meal just doesn’t feel complete. And for me a good salad is often enough to make a perfect meal. When making salads, I follow couple of simple rules: it has to be colorful, needs to have different textures and flavors and has to be a play between sweet and sour. The main rule for composing big salads is: crunchy base vegetable + one or two colorful accessories + some crunchy details or/and cheese. As far as dressing is concerned, it should always taste more slaty and sour. That’s how it will be perfect on your salad. And my basic rule is: never put white dressing on cheese. I love putting fruits in salads. They add wonderful color and flavor. 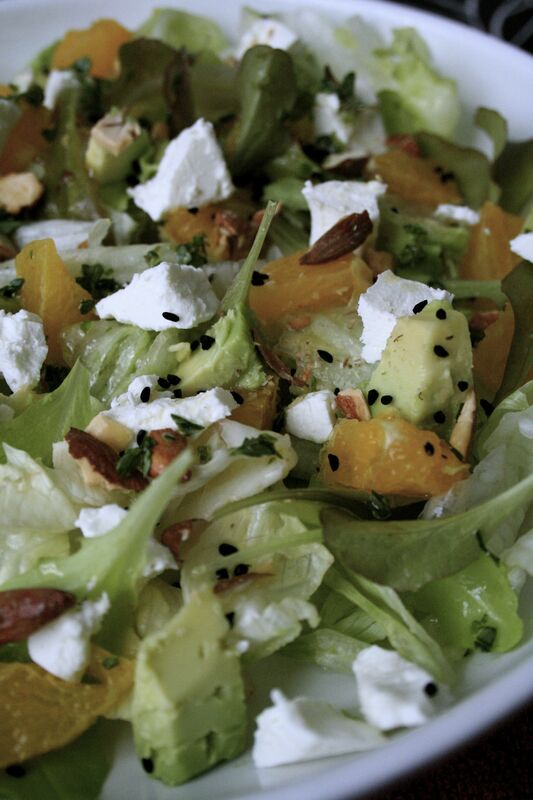 Oranges are superb in green salads. Just don’t forget to take off all that white skin. 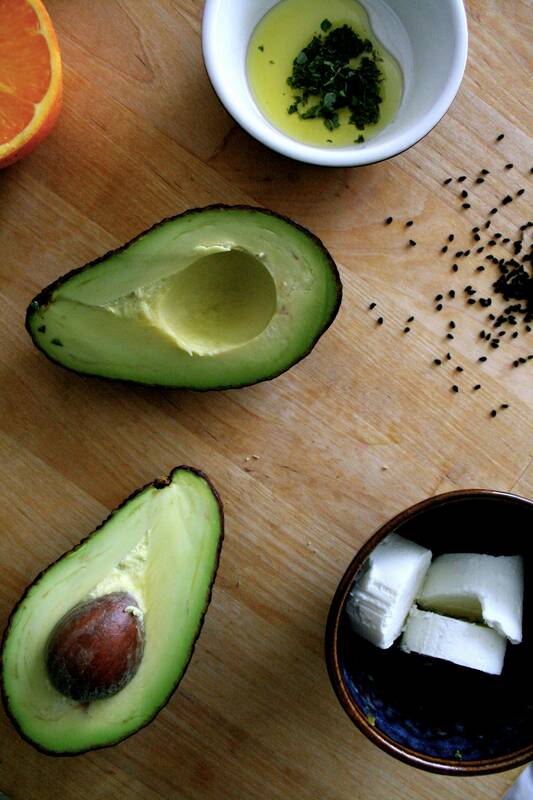 Avocado is actually a fruit, not a vegetable. 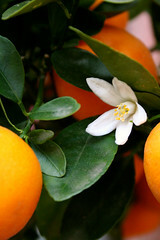 It is a good source of magnesium, potassium, vitamin K and vitamins B. It has high level of fat, but it’s good vegetable unsaturated fat. There’s about 15 g of fat in 100 g of avocado. You can easily use it as butter replacement in your other recipes. Avocados are picked hard and green and will ripen properly at room temperature in one to two weeks. If you buy them hard and don’t want to eat them straightaway, keep them in fridge. If you want them to get ripe more quickly, put them next to bananas. And yes, you should always have them on stock! Black cumin seeds always remind me of my trip to Egypt where we had wonderful bread with black cumin seeds in the morning. It was years ago and at that time I had no idea what it was. I’ve just remembered the taste. Since I’ve rediscovered it, it’s my favorite thing on oranges and goat cheese. Couple of crushed nuts like pistachios, almonds, walnuts, roasted or not, will give your salad a full rounded body. Salted roasted whole almonds add crunchy and a bit rustic flavor. 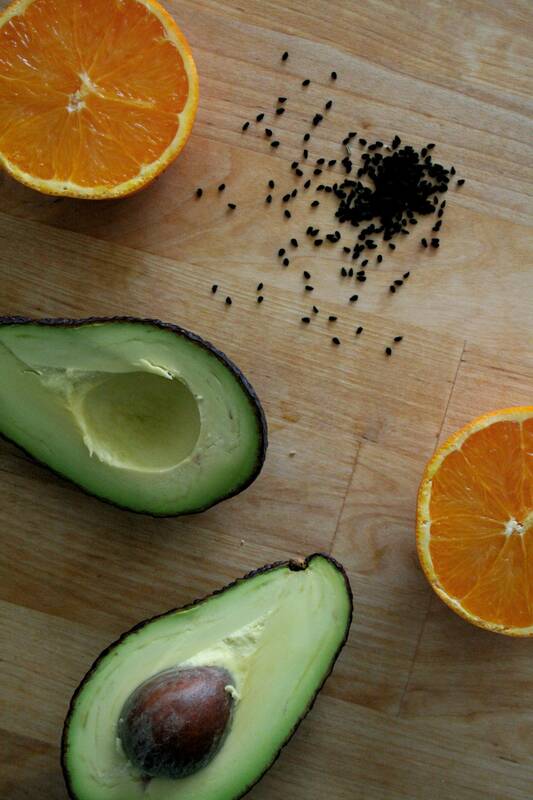 Cut avocado chunks. Peel and cut oranges. Remove white skins. Make dressing. Mix olive oil, lemon juice, thyme, salt and freshly ground pepper. 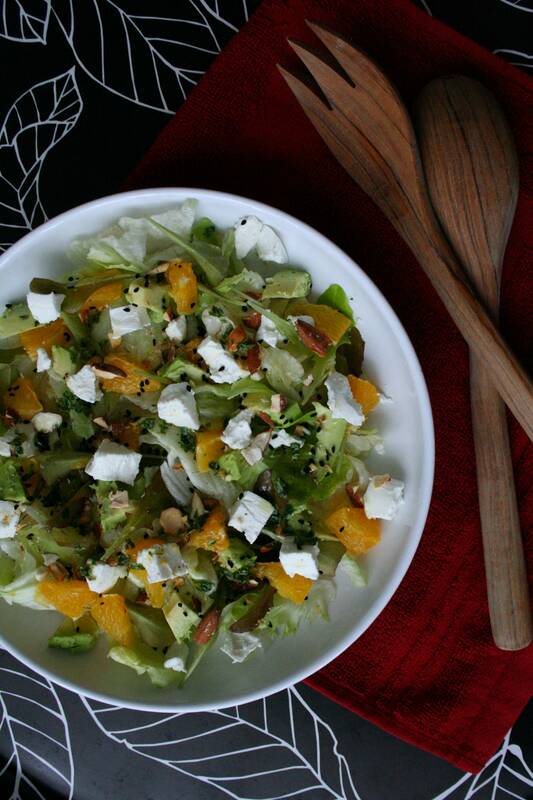 Assemble green salad, avocado chunks and oranges, rough pieces of cheese. Sprinkle with almonds, cumin seeds. Top with dressing. ← The way You hold your glass shows Your class!